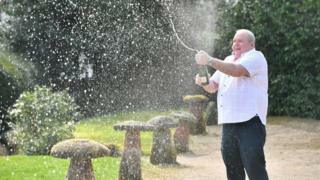 Ade Goodchild, 58, was the only winner of the £71,057,439 prize on Friday. He told a press conference he will retire after 24 years as a metal worker in Hereford, travel the world and buy a home with a swimming pool. Being single, he denied he was suddenly more attractive overnight, saying “just my wallet is”. Mr Goodchild is the 15th biggest winner in the history of the lottery. “I read the prize amount again and realised that it was actually £71 million and just one winner – me,” he said. Mr Goodchild also said he has his eye on a house that will have a Jacuzzi along with the swimming pool. Originally from South Wales, he celebrated by watching the Wales grand slam victory over Ireland in the Six Nations rugby championship, on Saturday. EuroMillions is played in eight countries outside the UK including Austria, Belgium, France, the Irish Republic, Luxembourg, Portugal, Spain and Switzerland.